There are normally many metrics by which to judge people and their suitability for any given job or role. Sadly, when it comes to political candidates for high office, one is forced to be overly dependent upon their words. What they claim to want is of primary, though nowhere’s near sole, importance in choosing between candidates. 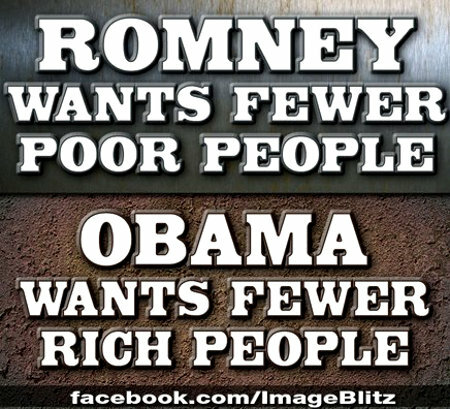 Judging by the words of the respective 2012 presidential candidates, Romney wants fewer poor people and Obama wants fewer wealthy people. You and I get to choose in November whose desires are in line the American ideal and whose are antithetical to it. Yes, I know; As a White, my judging Obama by any criteria except the “importance” of his racial identification is racist as far as the Left and their political sharecroppers are concerned. We can choose the candidate who claims to want to increase the wealth in America or we can choose to allow the candidate who always claims to want to spread the wealth in existence around. For our sake, the sake of our children, and the sake of our children’s children we damn well better choose wisely. This entry was posted on Monday, October 15th, 2012 at 6:40 am and is filed under 2012 Election. You can leave a response, or trackback from your own site.